ANNOUNCING OUR NEW TEAM MEMBER!!! Caro G of A Girl That Likes Books! Tif, Tasha, and I are very excited to welcome the newest member of the BBI team, Carolina G of A Girl That Likes Books! Caro has filled out our survey so you can get to know her better! Give her a warm welcome! I posted my first post on June of 2011, but it was only in September of the same year that I started reviewing and posting regularly, so I guess we can say almost 3 years now. I know I gravitate mostly around fantasy, because it takes me quite away from my "work" reading which are mostly scientific articles. But since I joined the Sword and Laser book club I've been more in contact with SciFi. I am trying to read more nonfiction lately though. Reading with my mom, I was probably around 5. She is the one who thought me how to read. During summer I really like a rocking chair I have on our terrace, but living in Canada, reading outside is not a year-long option sadly. I have 2 favorite spots around the house: 1. a papasan in our living room, which sometimes I have to compete with my cat for; 2. a red chair that is in our office. If you want, you can see both on my reviews, I usually have a picture taken on where I've been reading each book. My bookshelves are…: freshly organized…but I know it won’t last long! My TBR pile is... a never ending growing list! One book you like that no one else seems to? Oh I can never come up with an answer for this one…let’s see, maybe The Goldfinch, I mean a lot of people liked it but not a lot of them around me. Only one friend of mine finished it; it was okk, because he liked it so we ended up discussing it at length! How about a book that you dislike and everyone else seems to love? I was very happy with Gone Girl, and I liked the LOTR adaptation. I do think The Hobbit didn’t need to be a trilogy! Besides the ones from everyone here at BBI, I would say Estella’s Revenge by Andi, River City Reading by Shannon and lately I’ve been reading Ashley Riordan’s blog is not only about books, but she does have a wonderful BookTube channel. Today please welcome Laurie C, who blogs at BayState Reader’s Advisory blog . While traditional book and audiobook publishing continues to shift towards the e-book and downloadable audio, library lovers around the world are wondering what’s going to happen to libraries. As a public librarian, I care deeply about this question and hope the answer isn’t that the library will no longer be an actual place or be a place at all (even in the cloud). The fate of video rental stores, record stores, and possibly (gulp) bookstores looms large in this vision of a post-apocalyptic post-library future. But if publication of books migrates over the next decade to become entirely or almost entirely digital, what role would a public library play? Of course, we know that a library is more than its collections; a library provides a community gathering spot, Internet access, tech help, research assistance, etc., but we’re talking the future of books here, so let’s just talk books. As things stand now with e-books and e-audiobooks, most readers (including individual readers, families of readers, and students) who use libraries (whether public, school, or academic) couldn’t afford to buy every book they read or need, even if every book was available in a digital format they could use. Libraries currently act as go-betweens by offering e-book and e-audiobook lending through third-party vendors such as OverDrive and Freading who negotiate the licensing agreements with publishers. With every change in format over the years, library budgets get squeezed more. It used to be when a new title was published, a library would purchase it and start lending it out. Now, a library might be expected to buy that same title in print, large print, audiobook (CD and MP3-CD), and in also in several downloadable electronic formats (KindleBook, ePub, MP3). Not to mention the paperback edition when it comes out! In this transitional stage – as everyone tries to guess what the future of books will be – the push seems to be on to do to books what was done to music in the name of convenience. That is, remove DRM (digital rights management) to make reading and sharing e-books easier for the purchaser. It seems to me that if this happens, we’ll have to get used to having blinking ads and alerts on every page of every book we read and libraries won’t be funded because illegal sharing of e-books will be so commonplace. OR…we could continue to support our school, public, and academic libraries and keep them going. Libraries transitioned from cassette tapes to audio CDs; from videocassettes to DVD and now Blu-ray; and from print reference to digital. Can libraries survive the transition to a majority e-book collection? I hope we can figure out how. Others have been pondering these questions far better than I can do here, so here are some links to articles about the future of libraries and e-books. Thank you, Laurie for joining us today! Leave a comment for Laurie below! Thank you, Rachel , for joining us today for our month's subject: The Future of Books! The Future of Books or Publishers? No one can really predict the future. 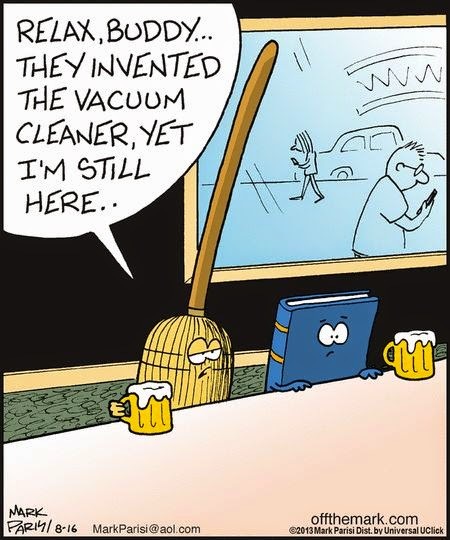 There was a time when people thought physical books would be all there would ever be. The digital book caught people by surprise. So if you disagree with my particular prediction, I’m okay with it. There are plenty of things in the future none of us can see just yet. That being said, I believe that the most uncertain aspect of future of books is publishers. Readers have been vocal about what they want, “…people are saying they want the things that a bookstore can offer.”1 Authors have been becoming their own advocates, “…hardly a month goes by without a well-known writer taking the leap [to self-publishing] or declaring an intention to do so.”2 The question is, can publishers adapt to accommodate the requirements of readers and authors? Can they remain relevant? Bloggers have become influential in the book world, and publishers have been catching on to this. Penguin has their First To Read program.5 Crown publishing has Blogging for Books.6 Independent publishers have also created beta-reader programs.7 All to start the word-of-mouth process of getting their books in the public eye. This is a very positive step for publishers to adapt to the still-changing literary landscape. Of course, there are still areas open for improvement. Books are illegally downloaded just as they used to be scanned without permission. Publishers are still fine-tuning agreements with libraries regarding approved ebook lending practices.8 But they are adapting a lot faster than the music industry has. The smaller, independent publishers are having a much easier time than the bigger publishers so it leads me to think that the Independent Publishers will dominate. We’ve already seen readers pushing for more independent bookstores and authors looking to self-publish from the start. It looks like the future of book publishing will have to center around independence. Another possibility is that publishers become the first phase of a writer’s career. With so many authors wanting to self-publish, you need a bit of name recognition before you can get enough readers to support you. Book publishers provide marketing and can easily build up a new author until they are able to stand on their own, if they so choose. The literary world is finally settling into a new mode in the digital age. Readers/Bloggers/Authors have found their places and their roles in this new realm and, as smaller groups, they can adapt quickly to any more changes that happen. What remains to be seen for the future of books, is what role the Publisher will play. Thank you, Rachel, for joining us today! Leave a comment for Rachel below! Today please welcome Heather, who blogs at Based on a True Story. I tell stories about my life from my perspective. I'm allowed to embellish though. Since 2004 and since 2005 on this site. I review books but my blog isn't limited to that. I quilt. I write weekly fitness reviews. I also talk my family and pets. Sometimes I go off on rants. I read everything. Fiction, nonfiction, all genres. I write most often about urban fantasy, historical fiction, and nonfiction. I'm sure there is some deep reason for that but mostly I wish there was magic and I like history. My brain just wants to be entertained. Nope! I get all my books from the library and they frown on that. I've learned the joys and challenges of tracking what I read. I've been tracking locations of my books for a few years to increase where I read. This year I'm working on reading translations and authors of color. I'm a sucker for a good cover. I hated Catcher in the Rye and Of Mice and Men and Great Expectations. I ruthlessly DNF. Life's too short to suffer through boring books. I'm actually going to Bath in 2015 because of all the Regency romances I've read. Thank you for joining us today, Heather! Remember to check out Heather's blog, Based on a True Story, and leave a comment or question. Thank you, Joy , for joining us today for our month's subject: The Future of Books! In my social media profiles, I claim my profession as librarian book blogger. Before that, I was a concession stand worker, a tour guide, a systems tech, a computer programmer, a customer support specialist, an entrepreneur, a magazine editor, and a web services librarian. While working all those jobs, I always had one secret dream career: author. My dream began at age 8 when I co-authored a mystery featuring a talking horse named Charley -- with only one published copy, handwritten on Big Chief writing paper. More recently, I completed a bad first draft of 50,000 words for NaNoWriMo (http://nanowrimo.org/) featuring tower bell-ringing in England. I'm still working on a, slightly better, first draft of a memoir. I don't know if I'll ever complete a publishable manuscript. If I do, I want it to be a book. A hefty physical object displayed in a book store window. A stiff spine with attached call number lined in proper order on a library shelf. A cover that I love or hate but, never mind, it's the cover of my book that I can caress. E-books were slow to enter my reading life but they finally took residence on my phone. Multiple books at my finger tips available in unexpected lines, waiting rooms, and odd moments while parked in the car? Yes, please. Still, I hope that I haven't waited too long to fulfill my dream of author. I want the future to include print books for the very selfish reason that I want to see my name on one. Thank you, Joy, for joining us today! Leave a comment for Joy below! Thank you, Flo, for joining us today as our first guest post on our month's subject: The Future of Books! As a reader (and lover) of physical books, I could feel threatened by the digital books: it is not the case. E-books belong to changes in the society; they reflect the way most of the people are living. I could say I don’t care since I’m not concerned, but somehow I’m concerned therefore I care. What troubles me more is the impact of e-books on human beings. At least each week a studies is published on this topic and, in general, these studies underline bad effects (on concentration, memory, sleep, etc.) which are straight away dismissed by any user afraid of such backlash. The problem is that when all the studies prove that the reading experience is different with a print book and an e-book, I suppose we can rely on them, at least a little. I’ve read few digital ARCs and I’ve noted that my memories at the end of the ‘book’ are vague, superficial whereas I do not have this problem with physical books (there can be exceptions of course - the quality of the content is also a factor - but I cannot name a single exception for digital copies). I assume if more and more people read digital books in the future it will have consequences on them on various level and, especially, in their way of seeing the world. Techniques impact reading; therefore, I suppose that the future of print books depends on what we expect from reading: A way of killing time? A hobby among others? An experiment having an impact on our lives and beings? Add what you want but, at the end of the day, what we are looking for in books is the key of our choices and it includes the choice between physical and digital. I can’t split reading and life; I suppose that’s why I feel concerned by these choices and, above all, by their consequences on the society. In November 2014, at a professional meeting on the future of the book industry at the digital age, I’ve seen great projects of ‘illustrated e-books’ (for adults): it was fascinating and beautiful but I’m not sure people will purchase these works to read them but rather to watch them as tiny movies. The ‘reader’ is distracted by the special effects and may pay a very little attention to the story. In France, this evolution implies a lot of debate, more on e-books than on the future of print books. These debate follow three main axis: legal issues, the role of the different actors and the financial impact on a whole industry. I’m not going to detail the arguments and, anyway, nothing is still precise and clear. What is quite specific to France is that, even if people change, books are still considered as special objects, even by non-readers; it’s in our culture. I will not detail our specifics because it would be too long but they play a role in the debate. Books can’t be sold like potatoes, outfits, you name it. Their prices are fixed by the publishers and only a 5% discount can be applied by sellers. Therefore, if the industry tries to find solutions to adapt its business model, it also has to take into account our traditions and what we don’t want to lose. I’ll just give an example – Librarians want to stay in contact with the users not only to give advice but also to protect them of data collecting by third party like Over-Drive. I discovered the existence of OD in December during an exchange on A Girl That Likes Books. Following that, I’ve made research and, indeed, OD is not welcomed in France. We’ve got laws on data collecting and private life and an organization is in charge of their respect. Librarians ensure borrowers their activity stays private and I like that. That’s a point that has always annoyed me regarding the use of e-books; e-readers seem to collect a lot of information on your reading habits and, even if by using the Internet, I know that my private life is not so private, I want to keep control on what I can, even when the information collected are trivial. If I’m sure that print books are not outdated, I’m not so confident about the fact that people are aware of the consequences of their choices and behaviors. I do hope I’m wrong because otherwise, one day, we will be the hostages of people whose interests are not literary. According to me, the only improvement relating to this matter is a better access to books and literature. The more people are reading, the better the world is. But we must be mindful and this availability should not result in less liberty and privacy. Thank you, Flo for joining us today! Leave a comment for Flo below! 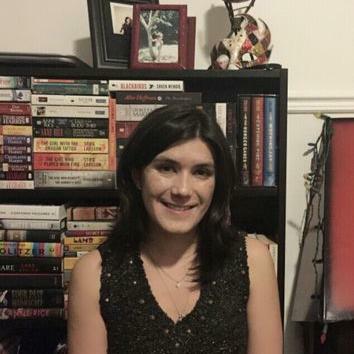 Featured Blogger: Paige from The Book Carousel.